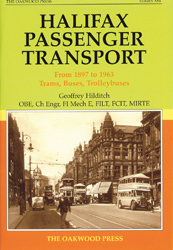 Geoffrey Hilditch’s earliest childhood recollections involved his first ever visit to Halifax in 1931 when he watched as a steady procession of trams and buses passed. After dusk his attention was drawn to a series of lights slowly climbing up into the night sky. They came not from some vintage spacecraft but from a tram or bus making its way to Southowram against the pitch black backdrop of Beacon Hill. In later years he came to know the area rather better. The post-war aroma of Halifax bus exhaust was decidedly off-putting, but in those later days when open staircase double-deckers were still to be seen in some quantity, he never imagined that in not too many years he would be professionally involved with Halifax Passenger Transport. That involvement began late in 1954 when he was appointed head of the engineering department. He Quickly discovered two things: firstly, the undertaking had a fascinating history and, secondly, things happened to passenger vehicles in and around Halifax that just did not seem to occur elsewhere. He returned to Halifax in 1963 as General Manager. He decided to piece the history together before it was too late, for the surviving records were sketchy and the number of men who had been involved in the early days was becoming ever fewer. Halifax presented the transport engineer with a considerable challenge. It was a source of some wonder how Messrs Escott and Spencer and their confr�res with virtually no previous experience could bring a fully operational tramway system into being and then, with an equally unskilled staff, keep it operational. For the drivers and conductors there was no sick pay, few holidays and long hours. Just how long those hours must have seemed to the driver of an open-fronted car on, say, the Queensbury route who for nine hours at a stretch might have had to brave arctic-like conditions in mid-winter with poor protective clothing can now hardly be imagined. But, in addition to needing stamina, such men also needed a high degree of physical strength for those trams, which weighed up to seven or eight tons laden, were stopped on average five to six times a mile by hand brakes that required more than a little effort to apply. This book is dedicated to those men who served their townsfolk so well, for they deserve to be remembered. A5 format, 336 pages, 220 illustrations.